Have you ever had days or weeks when life seems particularly frustrating? When there are too many little frustrations piling up? Case in point, finally after months of needing a haircut, I went in yesterday and treated myself at my fav salon. I brought in a photo that showed the general style I wanted…though we agreed on longer layers that would work whether my hair was straightened or in au naturel curls. Well, I realized after I got home and had a good look at my haircut that it didn’t look the way I wanted and some of the shoulder-length layers were bluntly chopped instead of well, feathery. And it was supposed to have more face-framing bits too. Though I’m smiling in this selfie, I’m not totally happy. I know it’s just hair. No biggie. I can get it recut. It will grow out…but it’s still frustrating when you pay a lot of money for something and it doesn’t turn out the way you want. And it’s never good when people say, “Oh, you got your haircut” instead, “Wow, your hair looks great.” Sigh…. Okay, I got that off my chest!! Now, if you are one of my faithful readers (and let me just say thank you! ), you may be wondering, “What’s this post got to do with vintage stuff?” I promise it does. Because here’s another of my frustrations in the spotlight…making stupid picks. I seem to be excelling at this lately. Just the other day I returned one stupid pick to Goodwill, just to replace it with another! In my defense I will say I think my replacement item is kinda cool. 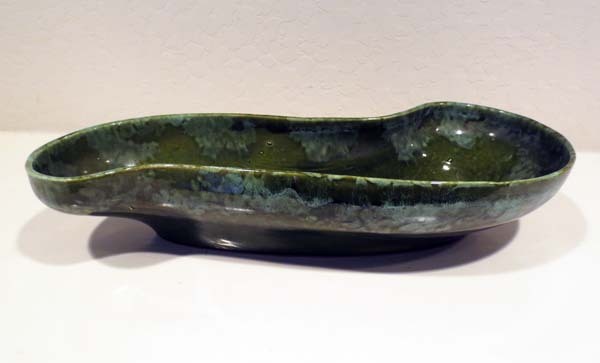 It’s a ’50s/’60s ceramic planter by Covina, CA. Olive green in a slight kidney shape. It’s just that the planter was used as a planter over the decades (how dare they!) and has a lot of crazing, a few manufacturing flaws and a chip. So even though it wasn’t in the minty condition that buyers want, I bought it anyway! For $3.69. Stupid. A third frustration…Etsy store lethargy! The last two weeks have been mighty slow in my stores. Mighty SLOWWWWW. 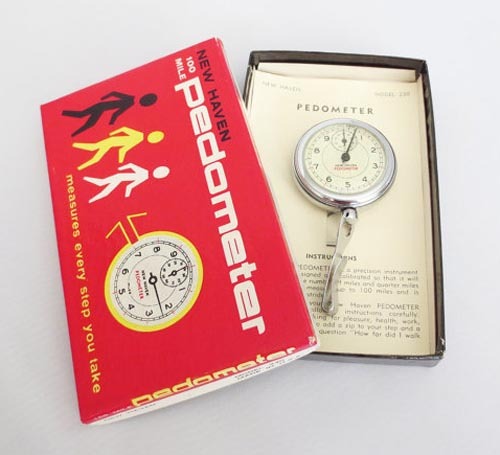 The only thing I’ve sold was a vintage pedometer that I was selling for a friend and I was giving all the money to her. Then, on top of that, last night the pedometer buyer contacted me and said she wants to return it because it doesn’t seem to be working. And if it truly isn’t working, then I need to refund all the postage money too, so I’ll be out $10! NUTS!! Okay, there’s more. More frustrations. But I’ll stop for now. Time to get out of this frustration funk and focus on all the good things in my life, all the blessings…and there are a ton! Wow! Your hair looks great!! Love your blog. Like hearing of your experiences. ← Right On William Morris!